Adidas have given the new generation of Adidas Adipure a new colourway update, so the boot is now available in an elegant combination of black, white and neon. This has given the leather boot a more natural look, which we take a closer look at here. Adidas definitely know how to celebrate Christmas. Since the calendar turned to December, it has been one big gift-storm and we are far from done yet. Today brings along yet another launch and this time it is the Adidas Adipure 11Pro II, which has been given a cool new colourway update. 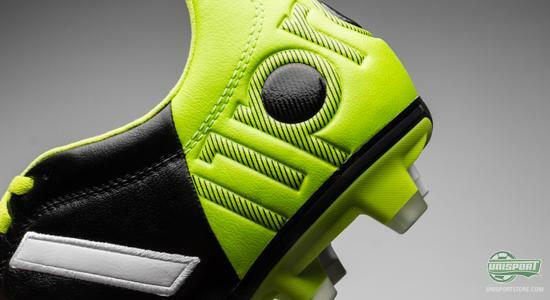 The new colourway is black, white and neon coloured, which most will probably think is a more classic look for a leather boot. It definitely is when compared to the bold and wild purple colourway that was part of Adidas Samba-Pack. 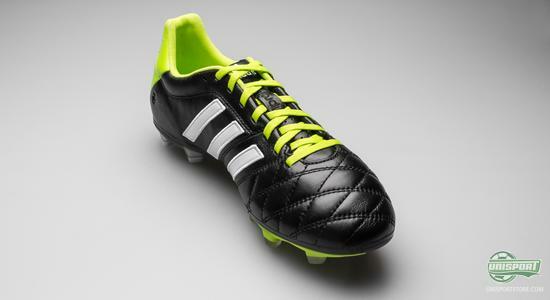 If you want the new Adidas Adipure 11Pro II, then you can see much more of it right here  just 152. With the new colourway you certainly face a tough choice. Do you want the brand new Adidas Adipure 11Pro II in a classic and elegant model, or do you prefer the wild purple colourway? 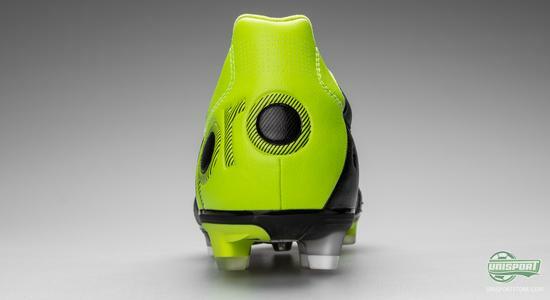 Regardless of what you pick, you will get a boot that is born to play football of the very highest order. 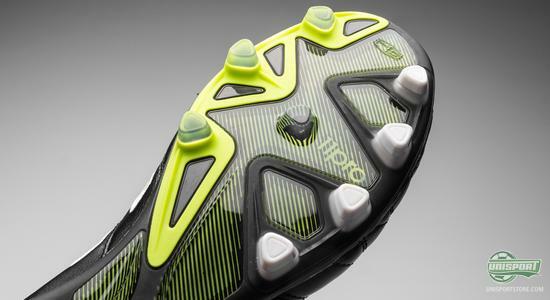 Adidas Adipure 11Pro II is the latest generation of Adidas modern Adipure-silo. Since the boot emerged it has stormed onto the big scene and today you can spot the boot on the feet of some of the biggest stars. 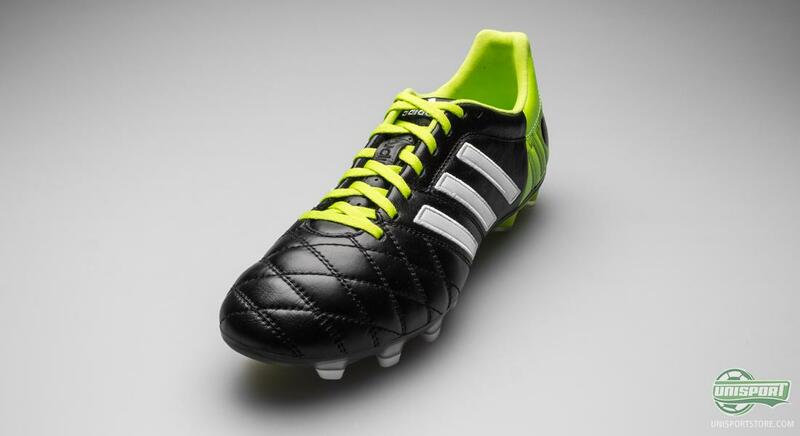 With the latest update Adidas have managed to make a good and already loved boot even better. The boot is once again made with an upper of Adidas nice and elegant Taurus leather. 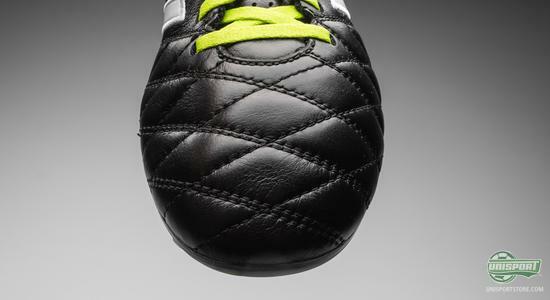 It is soft leather that gives an incredibly good fit and beautiful touch on the ball. If you are a football traditionalist, who swears by leather boots, you are definitely not going to be disappointed by the decision to choose this particular leather again. Adidas have however changed the upper slightly and added a few more stitches. This prevents the leather from stretching and at the same time it gives a very close and personal fit. This is just one of the many ways that Adidas have worked to improve the core values of the AdiPURE, which have always been touch, comfort and fit. Also worthy of noting is that Adidas have, with this new update of the AdiPURE 11Pro, gone away from the Duracoating technology, which you could find on the nose of the boot on the previous version. 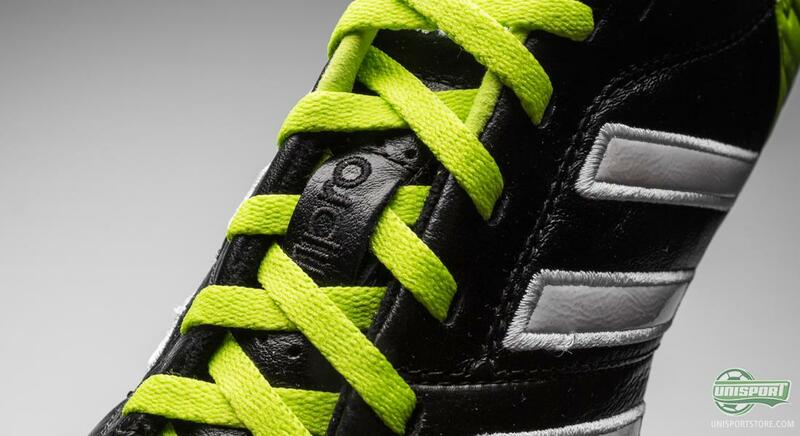 Duracoating gave added durability, but Adidas have deemed it unnecessary thanks to the new stitches on the upper, which make sure the leather doesnt stretch and thus increases durability. Just like we know from the former generation of AdiPURE 11Pro, the nice Taurus leather is from the mid foot and back replaced with a synthetic microfibre. This helps keep the weight down and at the same time is gives a dynamic and modern look to the boot. On the heel Adidas have also worked to improve the comfort and the Germans have covered the entire inside of the heel in a comfortable suede material. 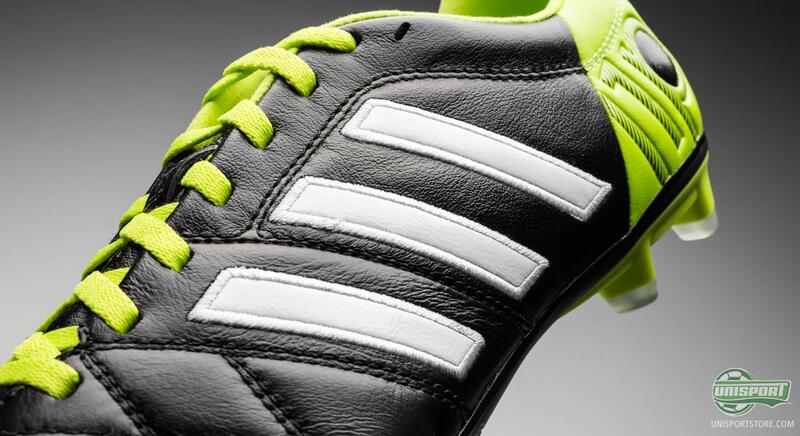 At the same time Adidas have also made sure the boot not only feels good, but looks good too. 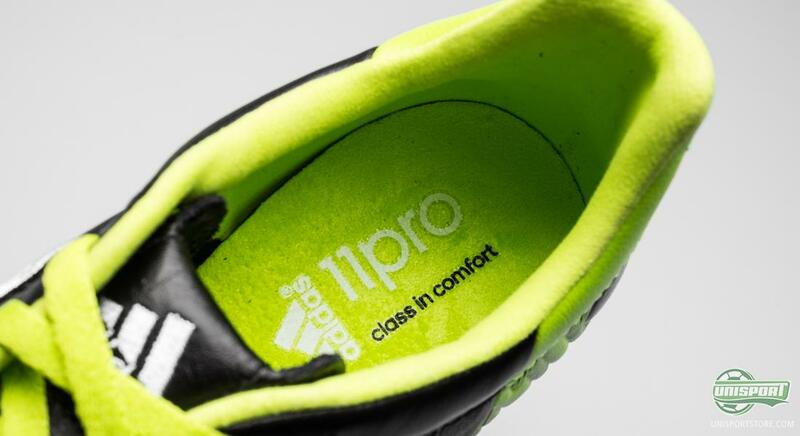 They have added the elegant 11Pro writing to the heel, which contributes to the class, which the Adidas AdiPURE 11Pro has always been known for. 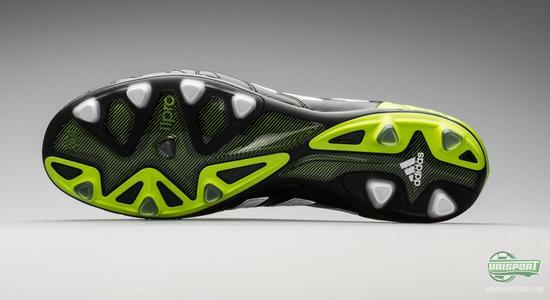 The sole is a place that Adidas have worked hard improve, by giving increased dynamics and comfort. They have added more torsion and support bars, which provide extra support, when you are out in the most extreme positions and need maximal energy and support. Adidas call this new frame the Comfortframe and as the name also suggests, it just shows how highly Adidas value comfort on this boot. 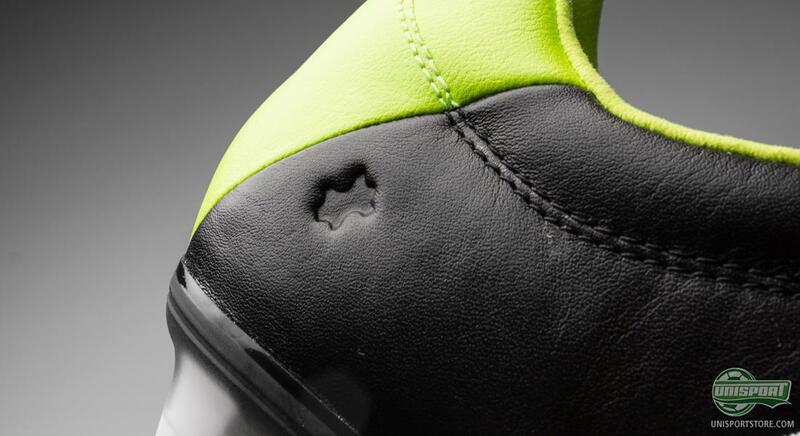 Adidas have also changed the studs themselves. There have been fitted more and they have shrunk in size slightly. This gives a greater dispersion of pressure, as the stress on each stud is spread out on more studs. At the same time the studs are rounder, which also helps to give a better grip. The Adidas Adipure 11Pro II is a classic boot, which has been improved with the latest generation and it has now also been given a new colourway update. What do you think about the boot? Do you like this colourway the most, or do you prefer the purple Adidas Samba pack version better? We would love to hear from you in the comment-section down below, or on Facebook and Twitter.